When it comes to gas leaks, most gas utility companies include some type of policy that requires gas leaks to be repaired. Oftentimes gas lines have small and undetectable (by odor) gas leaks, gas testing equipment helps inspectors to find if there are any gas leaks in the home. Both Natural gas and Propane gas are commonly used in homes to power heating systems, water heaters, dryers, stoves, fireplaces, etc. Natural gas is primarily composed of methane. (Methane is a highly flammable chemical compound consisting of one carbon atom surrounded by four hydrogen atoms.) 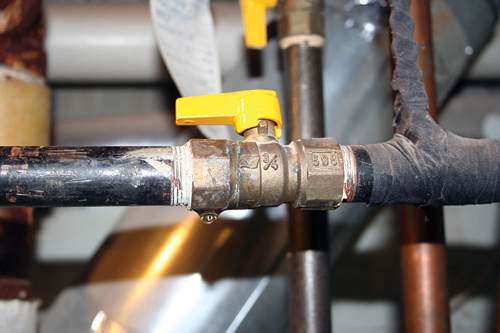 A natural gas leak can sometimes occur inside the home. In some cases, a natural gas leak can be dangerous because it increases the risk of fire or explosion. The local gas company works hard to provide adequate warning in the event of a gas leak. Because methane—and therefore, natural gas—does not have any odor, the gas company adds a warning “rotten-egg” smell (mercaptan or a similar sulfur-based compound) that can be easily detected by most people if there is a large gas leak.